Biomedical Engineering (BME) is one of the hottest and fastest growing subject in engineering at present. It is sometimes painted as a an emerging field or something that has come to the fore very recently. I rather think that biomedical engineering has existed for a long time. Everything from the invention of surgical scissors, x-ray machines and stethoscope could be brought under the umbrella of biomedical engineering (some may call that clinical engineering). It is perhaps impossible to agree on the definition of biomedical engineering but what all would agree upon is that this field draws experts from a range of other conventional science and engineering fields. These include biologists, chemists, mechanical engineers, electrical engineers, statisticians and many more. Universities are also increasingly offering specialised degrees in BME stringing together curriculum covering bits and pieces from all these conventional fields. Although the field of BME has existed in different forms for many years, the tremendous exponential growth it has seen over the last few years is unprecedented. I believe that this has been made possible due to vast and cheap computing powers available within our pockets. Gone are the days when you’d have to book time on a computer situated 100 miles away to do a certain simulation with the help of someone who was trained to use that beast of a machine (Of course, I wasn’t part of that great era and I have only read such stories). These days we have multicore computers and servers available in every R&D lab to do all the number crunching which has made possible the analysis of vast amounts of data. The other important contributor to BME’s growth is the availability of miniaturised ultra low power (ULP) sensors that can be hooked on to someone for long term monitoring – otherwise known as wearable devices. Better design techniques, low power circuits, improvements in battery technology and wireless connectivity have made it possible for us to record long term data and make sense our of it with our vast computing resources. Research in BME is being conducted in all parts of the world – some countries more advanced than the others. Numerous meetings and conferences bring together the researchers and scientists from different parts of the world where they share results of their recent work. The largest annual conference to discuss the advancements in BME is EMBC (Engineering and Medicine in Biology Conference) – hosted by the EMB (Engineering and Medicine in Biology) Society of IEEE. It is the place to be to get an insight in to current trends and future directions biomedical research. This year, EMBC was held in Chicago and featured over two thousand papers produced from the works of around seven thousand different researchers and scientists. Being the largest gathering of biomedical engineers and researchers, analysing the works presented at EMBC gives a glimpse in to the current trends in this exciting area. From the list of all papers presented at the conferences, a keyword analysis can be performed to see what’s the hottest subject within the domain of biomedical research. We can also deduce the regions and countries of the world that are leading biomedical research and deduce others which are only getting started. 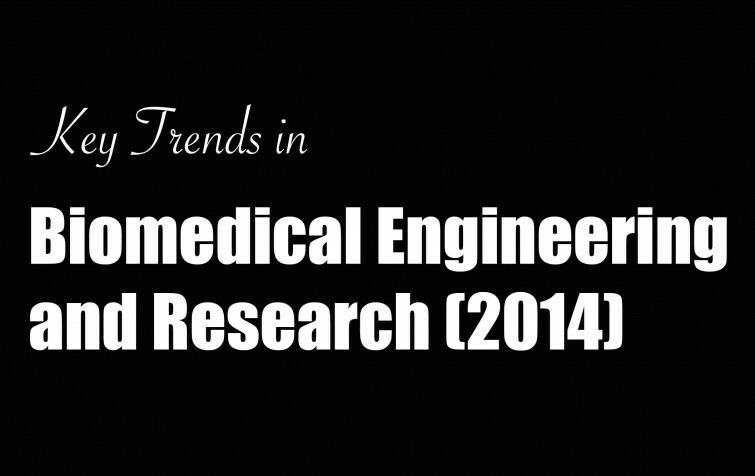 This analysis can be useful for anyone in the area of biomedical engineering and research to understand the key areas of research and development, countries where the field is more established thereby having more job opportunities and perhaps extrapolate the results to deduce the future trends within BME. The data source used for this analysis is the official EMBC 2014 programme available at http://embc.embs.org/2014/. This doesn’t account for the no-shows at the conferences which would later be removed from the proceedings. However, the assumption here is that the number of no-shows is small enough to make any impact on the final results. Some of the affiliations were improperly formatted e.g. rather than an institution name, the affiliation field said Graduate Research Assistant in a certain case. Some organisations are based in different countries so a question arises of whether there headquarter location should be used or the office location where the work is being done. Some affiliations used acronyms that aren’t well known outside their countries. For each of these cases and several others where affiliations weren’t clear, the public LinkedIn profiles, Google Scholar profiles and the official research pages of the authors were used to determine the country of the organisation they are affiliated to. This was a cumbersome task and required careful manual verification. The field of BME is a very vast one that covers engineering in various aspects of human biology. The great range of topics covered at EMBC is therefore unsurprising. However, as in all fields there are areas that receive more attention than the others due to their urgency, complexity and/or popularity. 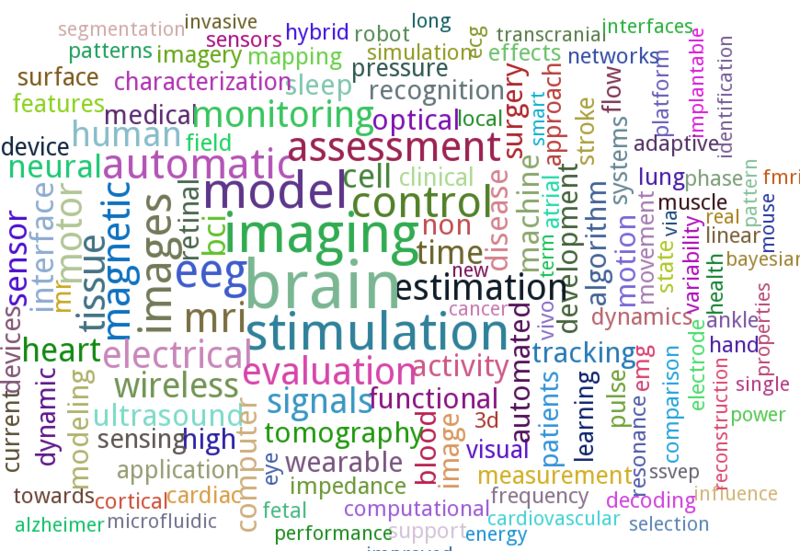 To find out the more popular research topics within the realm of BME I created a word cloud from the titles of all the papers presented at EMBC 2014. This was done using the wonderful PyTagCloud package. The word cloud shown below reveals that the word brain was used in the paper titles the most times (excluding the stop words of course). It also shows “eeg”, “transcranial”, “neural”, “bci” and “cortical” that are related to the brain. So it can be safely concluded that, at present, the brain is the hottest area of research in biomedical engineering. The other popular areas include heart, wireless, wearable and sleep. Other words such as automatic, monitoring, assessment and model suggest the nature of work being done within various application areas. EMBC is not only the largest gathering of Biomedical Engineers but it is also truly international bringing in top minds from around the world together on one platform. By finding out the country of the affiliation of each author it was possible to determine the different countries that were represented at the conference. This doesn’t include the non-presenting attendees who may be from other countries as well. Finally, some authors presented multiple papers at the conference so they are counted multiple times because what is being ascertained here is the research output from every country. The world map below shows the research output from each country. In total, the authors were represented from 62 different countries. A quick glance on the map shows, unsurprisingly, that the highest number of authors were from the US. The top five countries in descending order are USA, Japan, China, Canada and United Kingdom. These countries have many established research centres so it is not a surprise to see a large output from them, however it is great to see increasing levels of research output from developing countries. In terms of different regions, Japan takes the lead in Far East Asia followed by China, Brazil and Mexico in South America, India in South Asia, United Kingdom in Europe followed closely by Italy and France, Iran and UAE in Middle East and Egypt in Africa. Finally, I also looked at the most prolific authors at EMBC 2014 i.e. the authors who produced the maximum number of papers. The total number of papers listed in the conference programme were 2184 with 9502 authors across them (including authors who had multiple papers), so that gives a mean average of 4.35 (median average is 5) authors per paper, and the maximum of 19 authors for one paper. Since the authors per paper vary greatly across different research disciplines, this number can be used as an indicator of the trend in biomedical engineering research. The distribution of the number of authors per paper is shown in the chart below. Of the 9502 authors listed across all the paper, 7019 were unique. From these, I looked at which authors (co)authored the maximum number of papers. The result was a tie with Nitish Thakor (John Hopkins University, USA) and Hung T. Nguyen (University of Technology, Sydney, Australia) both featuring on twelve papers. Conventionally the main contributor of a paper is often named as the first author (although it may not be the case in certain countries). So I further looked at how many authors presented what number of papers as first authors. From the 2013 unique first authors, Gaetano Valenza (University of Pisa, MGH, Harvard Medical School) had the maximum of five papers as a first author. A similar analysis for the last authors (a slot conventionally reserved for PIs) of the papers revealed 1544 unique last authors. Of them, 13226 from Hung T. Nguyen (University of Technology, Sydney, Australia) featured as the last author on ten papers which is the maximum. The analysis performed here shows some important results but is by no means comprehensive. It currently shows the popular topics in biomedical research as well as the spread of different authors across the globe. It can be further extended to cover a gender analysis to see what is the male/female ratio of biomedical researchers overall and in different regions of the world. The affiliations of authors can be further analysed to study what proportion of authors came from academic institutions and from industrial organisations. Another interesting bit of data to look at would be the age range of authors to determine how many early career or established researchers were represented. Finally, the extent of cross-border collaboration could also be studied by establishing how many papers were authored by researchers from multiple countries. In future, performing similar analysis of EMBC every year can help us understand these key trends in biomedical research in a much better way.